Mario Balotelli Lets Random Liverpool Fans Drive His £240k Car! A tad illegal perhaps, but brilliant nonetheless! Young Liverpool fans who had gathered at Liverpool’s Melwood training ground got more than they bargained for earlier this week. 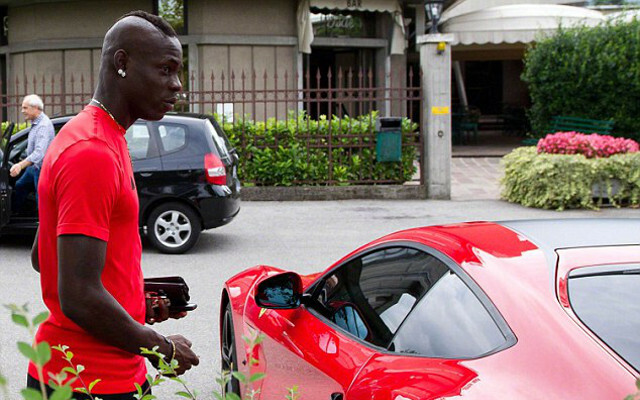 That’s because Reds striker Mario Balotelli decided to let them drive his £240,000 Ferrari around the car park. SEE ALSO: (Images) Mario Balotelli’s £240k Ferrari Shipped To Liverpool. A witness told the Daily Star: “There was a huge scramble of people wanting a go. Mario just sat in the passenger seat laughing his head off watching them try to get to grips with it. He had to give them a few tips when they struggled with the power of the car. “Luckily there were no accidents, but Mario didn’t seem worried anyway. (Hot WAG Gallery) Meet Bastian Schweinsteiger’s Magnificent Girlfriend Sarah Brandner! Victor Valdes Liverpool: Latest On Reds Move For Former Barcelona Goalkeeper. Cristiano Ronaldo Arsenal: Arsene Wenger Regrets Failed Bid For Portugal Goal Machine.